On a dry summer’s evening, on this day in 1953, Glasgow was a very busy place. There seemed to be a lot of hustle and bustle on the south side of the river, in particular, as football fans hopped on to buses and trains – although quite a few would also have walked – to see their sides compete in the first round ties of the Coronation Cup. It was almost incredible. Celtic, who had had their supporters in a frenzy of anguish with a series of displays unworthy of the club, in the season just ended, have beaten Arsenal, the English League Division One Champions….not only beating them but taught them how to play football…..Celtic produced combined football of such brilliance as to make even their most fervid follower wonder whence it came. 59, 300 were there to witness this display and had Arsenal lost by 5 or 6 goals they would have had no valid complaint. Their goalkeeper George Swindon had several outstanding saves and many other shots were just inches high or just wide. The Celtic team was Bonnar, Haughney, Rollo, Evans, Stein, McPhail, Collins, Walsh, Mochan, Peacock and Tully. Arsenal ; Swindon, Wade, Channell, Forbes, Dodgin, Mercer, Roper, Goring, Holton, Lishman and Marsden. All of the Celts played well but three men stood out. John McPhail at left-half and Bobby Evans on the right stamped their authority in the middle of the park and gave the Arsenal inside-forwards little space; while Neilly Mochan, newly signed from Middlesbrough, was all skill and thrust. The only goal, in 23 minutes, was really not worthy of the occasion. 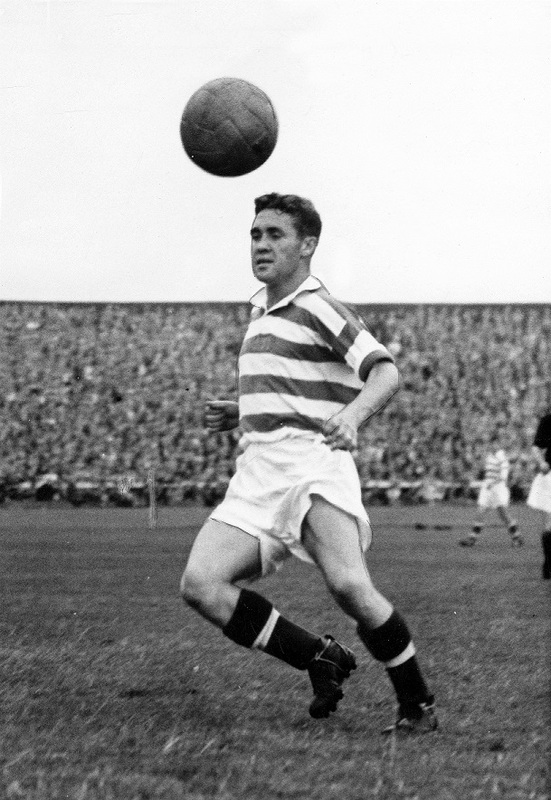 A corner kick by Bobby Collins was hoisted high up in the wind behind Celtic in the first half and as goalkeeper George Swindon jumped for it, the ball swerved violently, hit his hands and spun into the net. was another grand affair. Bailey, easily Spurs’ best forward, split Hibs’ defence wide open with a through pass to Walters, who shot a terrific grounder past the diving Tommy Younger. Hibs; Younger, Govan, Paterson, Buchanan, Howie, Combe, Smith, Johnstone, Reilly, Turnbull, Ormond. Tottenham; Reynolds, Baker, Nicholson, Marchi, King, Brittain, Walters, Bennett, Duquemin, Bailey, McLellan.